This item will help your 6th grade students to research the Ancient Civilizations you have taught in your class. The students will focus on Religion, Government, Social Class, Language (spoken and/or written) and Contributions to the world. 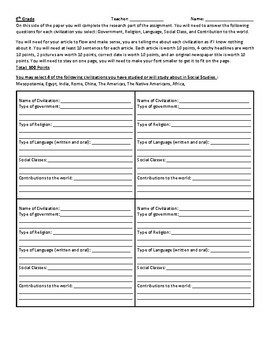 The students can then create a newspaper with other students in the class for a complete review of all Ancient Civilizations.